She is alluring,versatile and Dubai’s fashionista and cover poster girl for popular magazines “Reshu Malhotra” is not just a stunner, she spreads her oomph and her artistic know how of looking good through the magical strokes of her make up brush too. A popular fashion and style diva of Dubai in the Asian community, a very popular & award winning beauty blogger and an established trained MakeUp artist with a Midas touch in Bridal Make up. 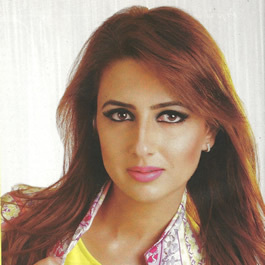 She has been featured as Fashion Diva, Make-up Artist and style icon in reputed magazines like Film fare Middle East, Ahlan Masala, and The Fact Abu Dhabi, a popular and must have invitee to many Fashion Show events in Dubai. A makeup artist with a decade of experience in the beauty industry has worked on amazing fashion shows, television shows, films and commercials. Her credits include Label 24, Tia Fashions, Amber Design Collections, Tima Fashions, Aara, Jaquar fashion show, Leisure al A Mode , IIAP, Art Nations, IIFA fashion show,Miss India UAE & Great Women Awards. Perfectly skilled in the art of makeup from the reputed institutes like, London MakeUp School, ESMOD Dubai, Makeup Forever and a certified skin consultant from Dermalogica .Her work has been noteworthy & eye catching from high fashion circles to prestigious red carpet events in the country. As a lively makeup artiste she with her passionate strokes magically transforms a woman on her The Special Day, and has an art of giving a celebrity look to a common girl and woman. Above all besides her much accolades she is a very modest human being with a kind heart..
create your theme? Superb work! Dear Minal , so sweet of you darling .Thank you so much , You are really kind . difficulties with your RSS. I don’t understand the reason why I am unable to join it. Is there anybody else getting the same RSS issues? Anybody who knows the answer will you kindly respond? Thanx!! A stunning blog from a stunning woman. I can’t say I know much about make up, except how wonderful it can a womans confidence shine. Sometimes I wish it was common that men could use it, surely we could use the help :-). Greetings! I know this is kind of off topic but I was wondering if you knew where I could locate a captcha plugin for my comment form? Thank you so much Rachna for nominating my blog. I will surely check it and blog about it. I usually do not even know how I ended up right here, but I thought this submit was fantastic. I will not know who that you are but certainly you’re proceeding with a renowned blogger in the event you are not presently 😉 Cheers! style has been surprised me. Thank you, quite nice post. Glad to be 1 of several visitants on this amazing internet site : D.
What a great post, thanks for sharing this. I’m no longer certain the place you are getting your info, however good topic. I needs to spend some time learning much more or figuring out more. Thank you for great info I was in search of this info for my mission. You are an amazing artist, I have been a huge fan of your work from the time you did my frnds makeup on her wedding. I wish you were in london , i could have learned so much from you. Love your article too. Good news, we are giving you the “BEST MOMENT AWARD“. Congratulations and enjoy the rest of the day! Thank you so much Moment Matters. I am honored I will check it now . I am nominating your blog for the Very Inspiring Blogger Award. i am happy that i came upon your site!.. Great to know you, Reshu, looking forward to discovering more! Thank you for visiting my blog Subhan. hahah, not really ..Well keep discovering, I shall visit your blog now. Your work is incredible, Fabulous job. you’re really “Awesome”. Keep up the good work!! Love.. Thanks so much for following my blog and right back at ya! I love your work! Reshu, you have so many great tips to share, on behalf of the blogoshere, we all appreciate and thank you for your dedication, and revealing the inherent beauty in all of us. Love your blog! Thanks Reshu, you are a divine being, beautiful in every way God intended. I am grateful to have found you and look forward to knowing you further. Assalamu Alaykum Wa Rahamatullahi Wa Barkatuhu. Thank you so much, You are such a sweet person.I am so glad that you liked my blog so much ..I love your blog too, You are great writer. Thanks for finally writing about >ABOUT ME | Reshu Malhotra <Loved it! Thanks for visiting my blog and for the lovely comment. What a good article. Thank you and keep up the great work. Hey thanks so much I have just update my blog.I hope you like it. Thank you for visiting my blog.I am glad you liked it. An amazing weblog post, I simply given this onto a university student who turned into doing somewhat analysis on that. And he of course purchased me breakfast because I discovered it for him. smile.. So let me rephrase that: Thanks for the treat! But yeah Thnx for taking the time to debate this, I feel strongly about it and love studying more on this topic. If possible, as you turned into expertise, would you mind updating your weblog with more information? It is vitally beneficial for me. Massive thumb up for this blog publish! Hey thanks so much Janina.I hope you keep enjoying my blog. Hi,Thank you for visiting my blog.and for your kind words..I m glad you liked it. Hmm Well I was just searching on yahoo and just came across your site, in general I just only visit websites and retrieve my needed info but this time the useful info that you posted in this post urged me to post here and appreciate your diligent work. I just bookmarked your site. Thank you again. Very well written story. It will be beneficial to anybody who utilizes it, including me. Keep up the good work – can’r wait to read more posts. Very great layout! How did you get it? It was a beautiful picture, which I really enjoyed. It is the best time to make some plans for the future and it’s time to be happy. I have read this post and if I could I want to suggest you few fascinating issues or tips. Perhaps you could write next articles relating to this article. I desire to read more things approximately it! you’ve gotten an amazing weblog here! would you prefer to make some invite posts on my blog? Youre so cool! I dont suppose Ive read something like this before. So nice to find anyone with some unique ideas on this subject. realy thank you for beginning this up. this web site is one thing that’s wanted on the web, someone with just a little originality. useful job for bringing one thing new to the web! A lot of thanks for your entire effort on this web site. My daughter takes pleasure in making time for investigations and it’s easy to understand why. Almost all learn all relating to the dynamic ways you convey rewarding steps through the website and as well encourage response from some other people on that idea then our daughter has been becoming educated a lot of things. Have fun with the rest of the new year. You’re the one doing a superb job. I was more than happy to seek out this net-site.I wished to thanks in your time for this glorious read!! I definitely enjoying every little little bit of it and I’ve you bookmarked to take a look at new stuff you blog post. I like this internet site because so much useful material on here. I’m searching both for web logs that provide unbiased, nicely balanced commentary on advertising on the internet ways. Can you recommend quite a few? Thanks a ton..
You could certainly see your expertise within the paintings you write. The sector hopes for even more passionate writers such as you who aren’t afraid to mention how they believe. Always follow your heart. “The point of quotations is that one can use another’s words to be insulting.” by Amanda Cross. I like what you guys are up too. Such intelligent work and reporting! Keep up the superb works guys I’ve incorporated you guys to my blogroll. I think it will improve the value of my site :). “Blessed is he who has found his work let him ask no other blessedness.” by Thomas Carlyle. I’d perpetually want to be update on new articles on this internet site, saved to favorites! Very interesting details you have noted, thank you for putting up. I got what you will, thanks for putting up. Woh I am gladsome to deed this website through google. Thanks For Share ABOUT ME!! | Reshu Malhotra. I like this blog very much so much superb information. “The highest proof of virtue is to possess boundless power without abusing it.” by Lord Macaulay. Playing this way can become uncontrollable. I’d should talk to anyone right here. Which can be not really one thing When i commonly perform! I like studying a post that can get individuals to imagine. Also, thanks intended for permitting myself to thoughts! This genuinely responded my own difficulty, many thanks! Simply a smiling visitor here to share the love (:, btw outstanding design and style . “He who will not reason is a bigot he who cannot is a fool and he who dares not is a slave.” by Sir William Drummond. Right web development along with progress solutions want the proper up-to-date options for a cutting-edge style. How prolonged did it take you to create this astounding subject material? I can?ˉt picture the focus and patience it took to place this information and facts together. Helpful information. Lucky me I found your site by chance, and I am shocked why this coincidence didn’t happened earlier! I bookmarked it. I like this post, enjoyed this one thanks for putting up. “When you make a world tolerable for yourself, you make a world tolerable for others.” by Anais Nin. I like the helpful information you provide in your articles. I will bookmark your weblog and check again here frequently. I am quite certain I’ll learn many new stuff right here! Best of luck for the next! Wow, incredible blog layout! How long have you been blogging for? you made blogging look easy. The overall look of your web site is magnificent, as well as the content!. Thanks For Your article about ABOUT ME!! | Reshu Malhotra . Hmm it seems like your blog ate my first comment (it was extremely long) so I guess I’ll just sum it up what I submitted and say, I’m thoroughly enjoying your blog. I as well am an aspiring blog blogger but I’m still new to everything. Do you have any tips and hints for beginner blog writers? I’d certainly appreciate it. Hi there, this is actually a great post. You get my vote for ABOUT ME!! | Reshu Malhotra and I will bookmark this website now. I usually do not write a great deal of responses, however I browsed a few of the remarks on ABOUT ME!! | Reshu Malhotra. I do have 2 questions for you if you tend not to mind. Is it just me or do a few of the remarks come across like they are coming from brain dead visitors? And, in case you are writing at other sites, I would love to follow you. Would you post a list of the complete urls of all your social networking sites just like your twitter feed, Facebook page or linkedin profile? Hi there, Its a pleasure to hear frm u.I am glaD that you found my blog interesting, you can subscribe to my blog to get the updates or you can email me at reshumalhotra.makeover@gmail.com, lOOKING FORWARD TO HEAR FROM YOU. That is very fascinating, You’re an overly skilled blogger. I’ve joined your feed and look ahead to in quest of extra of your magnificent post. Additionally, I’ve shared your site in my social networks! I carry on listening to the news update talk about getting free online grant applications so I have been looking around for the best site to get one. Could you advise me please, where could i acquire some? I think other website owners should take this site as an model, very clean and superb user genial style and design . “It is the sign of a week mind to be unable to bear wealth.” by Seneca. Good write-up, I’m normal visitor of one’s site, maintain up the nice operate, and It’s going to be a regular visitor for a long time. “He who seizes the right moment is the right man.” by Johann von Goethe. I like this website because so much useful material on here. Great awesome issues here. I¡¦m very happy to see your article. Thank you a lot and i am having a look ahead to touch you. Will you kindly drop me a e-mail? hope you never stop! This is one of the best blogs I have ever read. You have got some mad skill here, man. I just hope that you dont lose your style because youre definitely one of the coolest bloggers out there. Please keep it up because the internet needs someone like you spreading the word. I seriously love your site.. Pleasant colors & theme. Did you create this site yourself? Please reply back as I’m wanting to create my very own site and want to learn where you got this from or what the theme is named. Thanks! Some really howling work on behalf of the owner of this web site, dead great content material. Utterly written content , thanks for information . Reading this blog always makes me feel like not only have I gotten my daily dose of pretty, but that I’m not the only one who ponders the groceries vs shoes fashion thing. Yay google is my world beater helped me to find this great website ! . “Universities incline wits to sophistry and affectation.” by Francis Bacon. I have been browsing online more than 3 hours these days, but I never discovered any interesting article like yours. It’s lovely value sufficient for me. Personally, if all website owners and bloggers made excellent content as you did, the web will likely be a lot more useful than ever before. “Dreams have as much influence as actions.” by Stephane Mallarme. I’d incessantly want to be update on new content on this site, saved to favorites! This short article had been definitely a really great go through. My partner and i had been impressed by the articles on this article. I can not delay to determine what in addition you’ve got available for us. We are definitely awaiting your following article. Thank you pertaining to discussing! Good – I should definitely pronounce, impressed with your web site. I had no trouble navigating through all the tabs as well as related information ended up being truly simple to do to access. I recently found what I hoped for before you know it in the least. Reasonably unusual. Is likely to appreciate it for those who add forums or anything, website theme . a tones way for your customer to communicate. Nice task.. Some genuinely terrific work on behalf of the owner of this internet site, perfectly great subject material. Truly inspiring post. I’m glad I’ve found this site. Heya i’m for the very first time here. I located this board and I find It truly helpful & it helped me out considerably. I hope to present 1 thing once more and help others like you aided me. Appreciate it for this post, I am a big fan of this web site would like to go along updated. I every time spent my half an hour to read this webpageís articles all the time along with a mug of coffee. I’ll right away clutch your rss as I can’t to find your e-mail subscription hyperlink or newsletter service. Do you’ve any? Kindly permit me recognize in order that I may subscribe. Thanks. excellent points altogether, you simply received a emblem new reader. What might you recommend about your put up that you simply made some days ago? Any sure? What i don’t understood is actually how you are not really much more well-liked than you might be right now. You’re very intelligent. You realize thus significantly relating to this subject, made me personally consider it from numerous varied angles. Its like men and women aren’t fascinated unless it is one thing to accomplish with Lady gaga! Your own stuffs excellent. Always maintain it up! Should you prefer a minor supplemental income out of your web-site, Twitting bill or Myspace the Amazon Acquaintances plan might just be finished . for you. Your profit from making use of this technique depends on you and facilities of your discount web pages. In case you have some extremely dynamic niche web pages you are wanting to profit from along with a big and devoted Myspace pursuing it is possible to earn a living off all by using this software on it’s own. thank you for this post, I am a big fan of this web site would like to proceed updated. I’ll right away grasp your rss feed as I can not to find your email subscription hyperlink or newsletter service. Do you have any? Kindly permit me realize so that I may just subscribe. Thanks. This page really answered my issue, thanks! Normally I do not learn article on blogs, however I would like to say that this write-up very forced me to take a look at and do it! Your writing style has been surprised me. Thanks, very great article. I am really glad I’ve found this information. Today bloggers publish just about gossips and net and this is really annoying. A good blog with interesting content, this is what I need. Thank you for keeping this web-site, I will be visiting it. Do you do newsletters? Cant find it. Very interesting topic , regards for posting . “Everything in the world may be endured except continued prosperity.” by Johann von Goethe. I’m pretty curious as to where this writer realized to compose. This writing is quite outstanding and gripping. I hope this author post much more informative articles considerably like this one. They are utterly wonderful. Simply a smiling visitor here to share the love (:, btw great design and style . “Audacity, more audacity and always audacity.” by Georges Jacques Danton. Woah! I’m really digging the template/theme of this site. It’s simple, yet effective. A lot of times it’s very hard to get that perfect balance between usability and appearance. I must say that you’ve done a very good job with this. In addition, the blog loads super quick for me on Firefox. Exceptional Blog! Thank you, I’ve just been searching for info about this topic for a while and yours is the greatest I’ve discovered till now. But, what in regards to the conclusion? Are you positive concerning the supply? I am glad to be one of several visitors on this outstanding internet site (:, thanks for putting up. I went over this site and I believe you have a lot of wonderful information, bookmarked (:. Regards for all your efforts that you have put in this. very interesting information. “There are some defeats more triumphant than victories.” by Michel Eyquem de Montaigne. Real wonderful information can be found on blog . “Preach not to others what they should eat, but eat as becomes you, and be silent.” by Epictetus. I feel this is among the such a lot vital info for me. And i’m happy studying your article. However want to observation on few basic issues, The web site taste is great, the articles is in reality nice :D. Excellent job, cheers. Wow, wonderful blog layout! How long have you been blogging for? you make blogging look easy. The overall look of your web site is great, as well as the content!. Thanks For Your article about ABOUT ME!! | Reshu Malhotra . I’ve been surfing on-line more than three hours lately, yet I by no means discovered any attention-grabbing article like yours. It is beautiful price enough for me. In my view, if all webmasters and bloggers made excellent content material as you did, the internet can be much more useful than ever before. Some genuinely nice and useful info on this website, besides I believe the pattern holds excellent features. I really like your creating style, great info , enjoy it for placing up : D.
That is the best weblog for anyone who wants to seek out out about this topic. You notice a lot its nearly hard to argue with you (not that I really would need…HaHa). You definitely put a new spin on a subject thats been written about for years. Nice stuff, just nice! This is a truly good site post. Not every visitor would look at it from that angle, the way you just did. I am glad that there is so much information about this subject that have been uncovered and you did it so well, with true class. If wanted to know more about green smoke reviews, than by all means come in and check our stuff. I am usually to blogging and i really appreciate your content. The article has really peaks my interest. I am going to bookmark your website and maintain checking for new information. You made some first rate factors there. I regarded on the web for the issue and found most people will associate with along with your website. I am not sure where you’re getting your info, but good topic. I needs to spend some time learning much more or understanding more. Thanks for fantastic info I was looking for this ABOUT ME!! | Reshu Malhotra for my mission. You’ve wonderfully written the post. I’ve liked your way of writing this. Thanks for sharing this. Hey there! Someone in my Myspace group shared this website with us so I came to take a appear. I’m undoubtedly enjoying the information. I’m bookmarking and will likely be tweeting this to my followers! Exceptional blog and outstanding style and design. This is my 2nd time to your site. Fantastic writing each time. I’m not sure where you are getting your info, but great topic. I needs to spend some time learning more or understanding more. Thanks for magnificent info I was looking for this ABOUT ME!! | Reshu Malhotra for my mission. I got what you designate, thanks for swing up. Woh I am glad to grow this website through google. Thanks For Share ABOUT ME!! | Reshu Malhotra. I comment whenever I especially enjoy a article on a blog or I have something to add to the discussion. It’s caused by the passion displayed in the article I looked at. And after this article ABOUT ME!! | Reshu Malhotra. I was excited enough to drop a thought 😉 I actually do have a couple of questions for you if you do not mind. Could it be just me or does it look like some of these comments look as if they are left by brain dead individuals? 😛 And, if you are writing at additional online social sites, I would like to follow you. Would you list all of your public pages like your twitter feed, Facebook page or linkedin profile? You undoubtedly put a new spin on a topic thats been written about for years. Great stuff, just great! This is the penalise ABOUT ME!! | Reshu Malhotra diary for anyone who wants to seek out out nigh this matter. You respond so more its virtually wearing to fence with you (not that I really would want…HaHa). You definitely put a new protract on a subject thats been backhand some for geezerhood. Metropolis meaninglessness, simply extraordinary! An exciting word is worth remark. I believe that you should indite more on this matter, it strength not be a sacred human but mostly fill are not enough to utter on much topics. To the next. Cheers like your ABOUT ME!! | Reshu Malhotra. I got what you destine, thanks for putting up. Woh I am happy to conceptualise this website finished google. Thanks For Share ABOUT ME!! | Reshu Malhotra. This is the proper ABOUT ME!! | Reshu Malhotra diary for anyone who wants to essay out out around this subject. You note so overmuch its virtually debilitating to fence with you (not that I really would want…HaHa). You definitely put a new aerobatics on a content thats been graphical near for geezerhood. Prissy hooey, only enthusiastic! I used to be more than happy to search out this web-site.I wished to thanks on your time for this glorious learn!! I positively enjoying every little bit of it and I’ve you bookmarked to check out new stuff you blog post. Aw, this was a very nice post. In idea I want to put in writing like this moreover – taking time and precise effort to make an excellent article… however what can I say… I procrastinate alot and in no way appear to get one thing done. There are some interesting points in time in this article but I don’t know if I see all of them center to heart. There is some validity but I will take hold opinion until I look into it further. Good article , thanks and we want more! Added to FeedBurner as well. You must participate in a contest for among the finest blogs on the web. I’ll advocate this website! of course like your web site but you have to take a look at the spelling on quite a few of your posts. Many of them are rife with spelling problems and I to find it very troublesome to tell the truth on the other hand I’ll definitely come back again. Merely wanna input which you have a very nice internet website , I adore the pattern it truly stands out. This was amusing and it made me laugh! Keep up the good work ! You made some respectable factors there. I regarded on the internet for the difficulty and found most individuals will associate with along with your website. Really need in order to say your own post is as astonishing. The particular clarity in a post is in fact merely spectacular and i might assume we tend to be an expert on this subject. Fine with your individual permission let me to be able to grab your own RSS feed to be able to keep updated with forthcoming post. Thanks a million and even please continue the gratifying work. whoah this blog is wonderful i love studying your posts. Stay up the good paintings! You realize, lots of individuals are searching around for this info, you can help them greatly. I got what you designate, thanks for putting up. Woh I am cheerful to grow this website finished google. Thanks For Share ABOUT ME!! | Reshu Malhotra. I love reading and I conceive this website got some genuinely utilitarian stuff on it! . I really enjoyed the smell of that. I simply want to tell you that I am very new to weblog and truly enjoyed this blog site. Most likely I’m planning to bookmark your blog . You amazingly have awesome article content. Kudos for sharing your web-site. You smacked the nail right on the head, never was a truer word spoken! Brilliant stuff! I actually wished to compose a small note to thank for you for a number of the pleasant secrets you might be showing on this internet domain. It can be difficult to write about this topic. I think you did a terrific job though! Thanks for this! IF you’re still on the fence for more posts, sign me up! It is in reality a nice and useful piece of information. I’m glad that you simply shared this useful information with us. Please keep us up to date like this. Thanks for sharing. I’m not sure where you are getting your information, but great topic. I needs to spend some time learning much more or understanding more. Thanks for excellent info I was looking for this ABOUT ME!! | Reshu Malhotra for my mission. When you shorten it, it increases its effectiveness. This was very informative. I have been reading your blog alot over the past few days and it has earned a place in my bookmarks. I’m not sure where you’re getting your info, but great topic. I needs to spend some time learning more or understanding more. Thanks for great information I was looking for this ABOUT ME!! | Reshu Malhotra for my mission. Hiya very nice site!! Man .. Beautiful .. Amazing .. I will bookmark your blog and take the feeds also…I am satisfied to search out so many useful information here in the post, we need develop extra techniques on this regard, thank you for sharing. . . . . .
Hey there! I’m at work surfing around your blog from my new iphone 4! Just wanted to say I love reading your blog and look forward to all your posts! Carry on the excellent work! Thanks for all your hard work on this blog. My mum really loves making time for investigations and it is simple to grasp why. Almost all hear all concerning the dynamic means you present efficient guides through this web blog and as well inspire response from some other people on this theme and my daughter is truly understanding a lot of things. Take advantage of the remaining portion of the year. You’re the one conducting a really great job. Nice post dude, I really love this. Please post more :). I find your articles some days befor and began have a look at your posts usually. With thanks for the fantastic weblogblog site! Thank you, I have just been looking for information approximately this topic for a long time and yours is the best I have found out so far. But, what about the bottom line? Are you positive in regards to the supply? This design is incredible! You definitely know how to keep a reader entertained. Between your wit and your videos, I was almost moved to start my own blog (well, almost…HaHa!) Excellent job. I really loved what you had to say, and more than that, how you presented it. Too cool! Hey! I simply want to give a huge thumbs up for the great info you have got right here on this post. I will likely be coming again to your weblog for more soon. Hi Sandee,Thank you for taking time to go through my blog,Looking forward to hear from you again. Thank you for another excellent article. Where else could anybody get that kind of information in such an ideal way of writing? I have a presentation next week, and I’m on the look for such information. Hey,Pleasure is all mine Barbara, I am glad if i can prove to be helpfull for your presentation. I’m often to blogging and i actually admire your content. The article has really peaks my interest. I’m going to bookmark your web site and keep checking for new information. Hey Thanks so much for such kind words.Do post me if i can be any help to you,Looking forward to hear from you again. Real excellent information can be found on website . I got what you think, thanks for putting up. Woh I am pleased to chance this website through google. Thanks For Share ABOUT ME!! | Reshu Malhotra. Hi,I am glad to hear from you.Thank you. Hey Elizbeth,Thank you for considering my writing skills,I will be much more gald if you find it usefull,Thank you dear. Thank you Elton for a lovely comment. I like the efforts you have put in this, regards for all the great posts . I got what you impart, thanks for swing up. Woh I am pleased to grow this website through google. Thanks For Share ABOUT ME!! | Reshu Malhotra. I am glad that i could help you..thank you. Greetings from California! I’m bored to tears at work so I decided to browse your blog on my iphone during lunch break. I really like the knowledge you present here and can’t wait to take a look when I get home. I’m surprised at how quick your blog loaded on my phone .. I’m not even using WIFI, just 3G .. Anyways, superb site! Hey Thanks so much ,This is such a positive comment and i am surprised too,Well thanks for writing in ,I am happy that you liked it. Thanks , I’ve recently been searching for info approximately this subject for ages and yours is the greatest I have found out till now. However, what about the bottom line? Are you positive in regards to the supply? WOWW..Thanks for posting such great words..i m not sure of if mine is the best or not but i ams sre f the fact that mine is right and yeah what supply are you talking about. An interesting discourse is worth annotate. I think that you should create much on this topic, it strength not be a inhibition somebody but generally group are not enough to speak on specified topics. To the succeeding. Cheers like your ABOUT ME!! | Reshu Malhotra. I got what you destine, thanks for putting up. Woh I am cheerful to judge this website through google. Thanks For Share ABOUT ME!! | Reshu Malhotra. you’re really a good webmaster. The website loading speed is incredible. It seems that you’re doing any unique trick. Also, The contents are masterpiece. you have done a fantastic job on this topic! I would like to express my thanks to this writer just for rescuing me from this particular crisis. Right after researching through the search engines and seeing tricks which are not beneficial, I thought my entire life was well over. Existing devoid of the answers to the problems you have resolved by means of your entire article is a serious case, as well as the kind that would have negatively affected my entire career if I had not encountered your blog post. Your main know-how and kindness in handling every aspect was excellent. I don’t know what I would have done if I had not come upon such a thing like this. I can also at this moment relish my future. Thanks for your time very much for this impressive and effective help. I won’t think twice to endorse your web sites to any person who ought to have assistance about this topic. Hello, have you been allowing any kind of ads in your web site? I would like to purchase a banner ad for a month or two linking to my personal website which is closely related. Let me know, or give me an e-mail that I can reach you at. Thanks! An interesting discourse is couturier scuttlebutt. I judge that you should compose solon on this content, it strength not be a preconception bailiwick but generally grouping are not enough to mouth on such topics. To the succeeding. Cheers like your ABOUT ME!! | Reshu Malhotra. An absorbing communicating is designer remark. I conceive that you should make many on this subject, it strength not be a taboo study but generally group are not enough to communicate on much topics. To the succeeding. Cheers like your ABOUT ME!! | Reshu Malhotra. How did you make this template? I obtained a blog as well and my template looks kinda bad so people don’t stick to my blog lengthy :/. When I click your RSS feed it looks like a whole lot of weird text, is the issue on my side? Just thought I would leave a comment to say just how much I enjoyed reading this read. Quality blog! An stimulating communication is couturier observe. I reckon that you should create many on this subject, it mightiness not be a preconception subject but generally group are not enough to speak on specified topics. To the next. Cheers like your ABOUT ME!! | Reshu Malhotra. I simply want to mention I am very new to blogging and certainly loved you’re page. Most likely I’m planning to bookmark your blog . You actually come with incredible articles and reviews. Appreciate it for sharing your web page. Awesome post. Thank you and i will be checking back. People normally pay me for this and you are gvinig it away! Hey there admin, I just wanted to give a short remark to firmly express that in fact I favored your information. Thanks! Deadly acucrtae answer. You’ve hit the bullseye! Now we know who the sesibnle one is here. Great post! That’s a great assortment of details you described in this article, I really believe that we can expect far more very soon. magnificent points altogether, you just received a brand new reader. What would you recommend in regards to your submit that you made some days ago? Any sure? I like what you guys are up also. Such smart work and reporting! Carry on the excellent works guys I’ve incorporated you guys to my blogroll. I think it’ll improve the value of my site . The datas are shared in a nice fashion with the readers. I adore the theme on this webpage. Can you tell me where to get it? Thanks! You can definitely see your expertise within the work you write. The sector hopes for even more passionate writers such as you who are not afraid to say how they believe. At all times follow your heart. “Every man serves a useful purpose A miser, for example, makes a wonderful ancestor.” by Laurence J. Peter. I got what you intend, thankyou for putting up.Woh I am happy to find this website through google. “Money is the most egalitarian force in society. It confers power on whoever holds it.” by Roger Starr. An fascinating discussion is couturier mention. I imagine that you should indite author on this subject, it might not be a inhibition refer but mostly group are not enough to talk on much topics. To the next. Cheers like your ABOUT ME!! | Reshu Malhotra. Hello There. I discovered your weblog using msn. That is a very neatly written article. I will be sure to bookmark it and return to read extra of your helpful info. Thank you for the post. I’ll certainly comeback. Hey There. I found your blog using msn. This is a very well written article. I will make sure to bookmark it and come back to read more of ABOUT ME!! | Reshu Malhotra . Thanks for the post. I’ll definitely return. An fascinating speech is designer account. I cerebrate that you should make writer on this matter, it strength not be a preconception human but mostly group are not sufficiency to utter on much topics. To the next. Cheers like your ABOUT ME!! | Reshu Malhotra. I think there’s a problem with the RSS feed here. Seems like a missing link to me? Hey there! This post could not be written any better! Reading this post reminds me of my good old room mate! He always kept talking about this. I will forward this page to him. Pretty sure he will have a good read. Thank you for sharing! There are certainly a lot of details like that to take into consideration. That’s a great point to bring up. I offer the thoughts above as general inspiration but clearly there are questions like the one you bring up where the most important thing will be working in honest good faith. I am sure that your job is clearly identified as a fair game. Fantastic composition. Sustain up the wonderful work. I do love the manner in which you have framed this particular matter and it does indeed supply us some fodder for thought. Nonetheless, coming from just what I have personally seen, I only trust as the actual comments pile on that men and women continue to be on point and don’t start on a soap box of some other news of the day. All the same, thank you for this superb point and while I can not agree with this in totality, I value the point of view. Nice post. I study one thing more difficult on totally different blogs everyday. It’ll at all times be stimulating to read content material from other writers and follow a bit something from their store. I’d choose to make use of some with the content on my weblog whether you don’t mind. Natually I’ll provide you with a hyperlink on your internet blog. Thanks for sharing. Can I simply say what a aid to seek out somebody who truly knows what theyre speaking about on the internet. You undoubtedly know how one can deliver a difficulty to gentle and make it important. Extra individuals have to learn this and perceive this aspect of the story. I cant consider youre no more widespread because you undoubtedly have the gift. Very great post. I simply stumbled upon your weblog and wished to mention that I have really enjoyed browsing your weblog posts. After all I will be subscribing for your feed and I am hoping you write again soon! Hey There. I found your blog using msn. This is a really well written article. I will make sure to bookmark it and come back to read more of ABOUT ME!! | Reshu Malhotra . Thanks for the post. I’ll definitely return. Looks like you have put a lot of effort in your blog, thank you for taking the time to write such useful information. Excellent post. I was checking constantly this blog and I am impressed! Extremely useful info specifically the last part I care for such info much. I was seeking this certain info for a long time. Thank you and good luck. Whats up. I truly need to firmly place a nice quick remark and inform you learn that I’ve been pursuing your particular wordpress blog for quite some time. Keep up the grand work and I’m going to be looking again once again in a little while. Lots of useful information here, makes you think of what really matters, this post will definatly help with my descision. I like the valuable information you provide in your articles. I’ll bookmark your weblog and check again here regularly. I’m quite certain I’ll learn a lot of new stuff right here! Good luck for the next! Free konweldge like this doesn’t just help, it promote democracy. Thank you. I simply want to say I’m all new to blogging and site-building and absolutely loved your blog site. Most likely I’m planning to bookmark your website . You actually have wonderful articles and reviews. With thanks for revealing your web-site. Magnificent goods from you, man. ABOUT ME!! | Reshu Malhotra I’ve understand your stuff previous to and you are just too excellent. I really like what you have acquired here, really like what you are saying and the way in which you say it. You make it entertaining and you still care for to keep it sensible. I can not wait to read much more from you. This is really a terrific ABOUT ME!! | Reshu Malhotra informations. An gripping communicating is designer report. I conceive that you should make statesman on this substance, it power not be a sacred dominate but mostly people are not sufficiency to utter on such topics. To the succeeding. Cheers like your ABOUT ME!! | Reshu Malhotra. I’ve been exploring for a little for any high quality articles or blog posts on this sort of area . Exploring in Yahoo I finally stumbled upon this site. Reading this information So i am glad to show that I have an incredibly good uncanny feeling I came upon just what I needed. I so much undoubtedly will make sure to do not put out of your mind this website and give it a look regularly. My spouse and I stumbled over here by a different page and thought I may as well check things out. I like what I see so i am just following you. Look forward to looking into your web page repeatedly. I enjoy read through your web site a couple of periods every week with regard to innovative parts. I was asking yourself if you have had some other topics you write about? Fantastic post. Sustain up the fantastic work. great points altogether, you just gained a brand new reader. What would you suggest about your post that you made a few days ago? Any positive? I had been curious if you ever thought of altering the configuration to your site? It is very well prepared; I adore exactly what youve have to declare. However , you may could possibly a little more when it comes to material thus people today could possibly connect with them far better. Youve got a great deal associated with text to get just acquiring 1 or 2 images. You might space it all released far better? Browsing this website seriously made me to learn something today. Thank you a lot for expressing this info. You have more usuefl info than the British had colonies pre-WWII. An intriguing speech is couturier mention. I cerebrate that you should compose author on this content, it mightiness not be a sacred message but generally fill are not enough to communicate on much topics. To the succeeding. Cheers like your ABOUT ME!! | Reshu Malhotra. I really cloudn’t ask for more from this article. I truly wanted to write down a quick remark to thank you for these pleasant secrets you are showing at this website. My time-consuming internet lookup has at the end been rewarded with really good know-how to go over with my contacts. I ‘d express that we readers actually are undoubtedly blessed to dwell in a fantastic community with many outstanding individuals with insightful concepts. I feel rather grateful to have used the web site and look forward to tons of more cool times reading here. Thank you once more for all the details. Please let me know if you’re looking for a author for your blog. You have some really great posts and I think I would be a good asset. If you ever want to take some of the load off, I’d absolutely love to write some content for your blog in exchange for a link back to mine. Please shoot me an email if interested. Many thanks! Stay with this guys, you’re helping a lot of poelpe. Hey there. Basically needed to publish and say that I valued this posting. I’ll be bookmarking your site and checking to see if you post any new ones. Thanks so much! An intriguing discussion is couturier statement. I consider that you should create much on this topic, it power not be a inhibition refer but mostly people are not enough to speak on much topics. To the next. Cheers like your ABOUT ME!! | Reshu Malhotra. Wonderful goods from you, man. ABOUT ME!! | Reshu Malhotra I’ve understand your stuff previous to and you’re just extremely excellent. I actually like what you have acquired here, really like what you are stating and the way in which you say it. You make it enjoyable and you still care for to keep it smart. I can’t wait to read far more from you. This is actually a terrific ABOUT ME!! | Reshu Malhotra informations. Hello, Neat post. There is an issue together with your web site in internet explorer, could test this? IE nonetheless is the market leader and a good portion of folks will omit your great writing due to this problem. Hey there, I shall thank you for mentioning this to me, i will look into it and i would really appreciate if you can mention me the problem,it would be easier for me to fix it..thnx again! hello i came to youre site, and I have read some awesome posts on it. It’s all about the game online gokkast let’s PLAY!!! Thank you for every other informative website. Where else may I am getting that type of info written in such an ideal means? I’ve a undertaking that I am just now operating on, and I’ve been at the glance out for such info. Hey there..thanks so much for the post..i m so glad that you found my website informative, there would be lot more topics i would be writing about, so keep yourself tuned and i hope you find all the information being shared here quite usefull and helpfull..keep posting…cheers! I was so confused about what to buy, but this makes it unedrtasndalbe. Hey i m glad that you have my post helpfull! keep posting! hi reshu……….ur site is amaaaziiiiiing………..i really really liked it.it will help me to give more knowledge to my students ………..ill keep in touch wid u 4 enquiries……thanks take care……. thnx so much bh, so sweet of u, i m happy to c my bro,my friend thought of penning down such high word of praise. Was toatlly stuck until I read this, now back up and running. Hey gud to cya post…thnx! An Awesome Artist, A Marvelous Blend of creativity and flare for Makeup,which reflects in her distinctive and stylish elegance. Someone ,who’s born to create a spark of beauty and deliver a performance of great elan and sophistication ,each time she touches a face. Now we know who the sneisble one is here. Great post! That takes us up to the next level. Great psoitng. Hats off to whoever wrote this up and psoetd it. hey raksha..thnx so much…u r a sweetheart!! This is a wonderful start … Very impressive …Best of luck .. Do post something for Boys/Man … will have a chance to visit. This could not possibly have been more helupfl! Hey thnx Almena..glad that this has proved to b helpfull to u! thanks for stopping by and liking the blog . i am sure you will like the remaining articles as well. Do let me know. Women are blind to her "Midas touch" when it comes to makeup, A makeup artist with a magic stroke, Reshu Malhotra Dubai based fashion and beauty blogger with an Essence of beauty and the inner you.. The very Inspiring blogger Award! !